Nokia has made its oft-leaked Lumia 1020 all official, bringing a souped up 41MP camera to the smartphone party. As the Lumia 1020 is a 4G enabled smartphone you'll be able to take advantage of the superfast speeds currently offered by EE, O2 and Vodafone - but don't forget Three will launch its LTE service in December. The Nokia Lumia 1020 is now available to pre-order in the UK with the release date set for September 25. If you do pre-order the Lumia 1020, Nokia will treat you to some additional goodies for free including a Nokia Camera Grip, wireless charging back cover, wireless charging plate and tripod. So where can you get your hands on this Windows Phone 8-toting handset? Well luckily we've been around the various networks and retailers to find out who's offering it, and for how much - just for you. O2 has managed to bag itself an exclusive in the form of the 64GB variant of the Nokia Lumia 1020, meaning you'll be able to keep on snapping without fear of filling up the internal storage. Unlike the iPhone 5C, the Lumia 1020 will work on O2's 4G network from the word go, and if you don't want to pay any money up front you can get the handset for free on a £47 per month two year Refresh contract - but that'll give you just 1GB of data. You can bump your monthly outlay to £52 a month for 5GB of data and a free handset, but that's quite a lot to shell out. There's also the option to get the Lumia 1020 on a 3G contract, which sees the monthly cost come down by a few pounds and different data options available: 750MB, 1GB, 2GB and 4GB. Three has also hopped aboard the Lumia 1020 bandwagon, and it has confirmed the presence of the Lumia 1020 in its ranks some time ago. You can pre-order the handset from Three ready for delivery on September 25 with prices starting from £69 upfront on a £34/month contract over 24 months. The network which brought the first 4G network to the UK and Vodafone will also be stocking the Nokia Lumia 1020, but there's currently no sign of a pre-order page on either website, nor any news on prices. While EE and Vodafone may not have any news of the Lumia 1020 on their sites, over at Phones 4 U these are the only two networks you can pre-order the handset on. The EE owned T-Mobile and Orange also make an appearance with 3G-only contracts. You can pick up a Lumia 1020 for free on both EE and Vodafone 4G tariffs, but you'll have to shell out £46 or £52 per month respectively for the privilege with the former offering 10GB of data and the latter 8GB. If you want to spend around £40 per month then you'll only need to shell out £29 in advance for a two year contract on EE (£41pm) or Vodafone (£42pm). 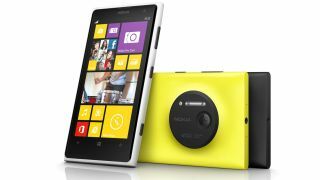 Carphone Warehouse will be stocking the Nokia Lumia 1020, but apart from a registration page a "coming September 2013" details are scarce on tariffs. The folks over at Unlocked Mobiles have the Nokia Lumia 1020 up for pre-order for the princely sum of £549.98, which makes the handset one of the most expensive around. Interestingly though it has a Lumia 1020 release date of September 30 listed on the product page. Expansys has the Lumia 1020 up for pre-order at a wallet stretching £599.99 with the choice of black, white and yellow for you to pick from. The price over on Clove is no better with the black, white and yellow versions of the Nokia Lumia 1020 listed at £588 a pop. The site does state "first stock arriving September 27th" - so you may be waiting an extra couple of days.